You'll have peace of mind while at the helm with the Garmin inReach Mini Marine Bundle. With a paid subscription, this satellite communicator can send and receive texts anywhere in the world via the Iridium global service. It comes with a screw-down mount and a 12 VDC power cable. The Mini Marine comes with a host of features to make boating safer and more enjoyable. If you encounter trouble, you can send an SOS to the 24/7 GEOS emergency response service, which will dispatch local first responders to your aid. You can remotely control the inReach Mini Marine to send and receive messages using compatible Garmin chartplotters, handhelds, wearables, or other mobile devices; share GPS-based information on your whereabouts; post your journey on social media; sync with your smartphone to access unlimited maps, aerial imagery and U.S. NOAA charts (along with your phone's contacts list), and get detailed weather information on the go, on a basic or premium basis. Satellite subscription plans range from $11.95 to $99.95 per month. The inReach Mini Marine measures just 3.9 x 2.0 x 1.0" and weighs just 3.5 ounces. Rated IPX7, it can withstand rain and splashing. No need for a cell signal—the inReach Mini Marine uses the global Iridium satellite service, so you can send and receive messages anywhere. You can reach the GEOS emergency response service if trouble arises. The 24/7 service, which has supported rescues in more than 140 countries, alerts local authorities and first responders to come to your aid. Routes, waypoints, and tracking via the web-based MapShare portal. Sync the inReach Mini with your phone or tablet and use the free Earthmate app to access unlimited maps, aerial imagery, and U.S. NOAA charts. Earthmate allows you to use all of the inReach features on your paired mobile device and to use your phone's contact list. Basic and premium weather alert packages are available. You can receive weather forecasts for your current location or any other waypoint or destination on your itinerary. The internal, rechargeable lithium battery provides up to 50 hours use at the default 10-minute tracking mode and up to 20 days in power-saving mode. Recharge via 12 VDC power cable. 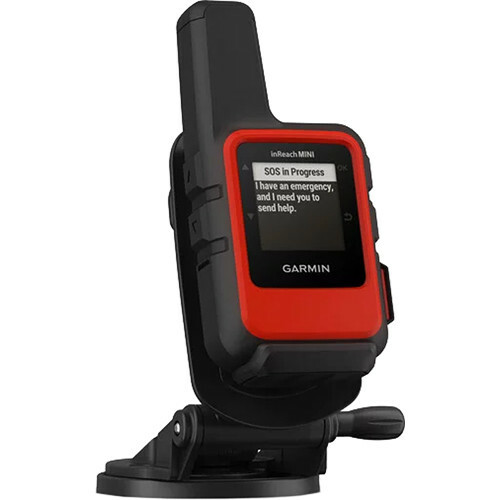 The device comes with free access to the cloud-powered Garmin Explore website to plan your trips with routes and waypoints, create preset messages and quick texts, sync and manage your device settings, update your firmware, link your social media accounts, store all your location tracking data, and more. Box Dimensions (LxWxH) 8.05 x 5.6 x 3.45"